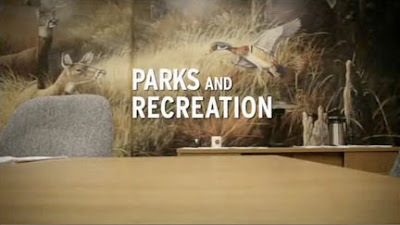 Back of the Head: Parks and Recreation 2x19 - "Park Safety"
Or... The One Where They Make Fun of Jerry The Whole Episode. This week made it pretty clear making fun of Jerry is pretty much the only thing they can do with Jerry. Sure, they're dicks, but it turns out the guy is a clown. Aubrey Plaza's reaction shots pretty much ruled this episode. Especially when Jerry was giving his presentation and when Andy and Ron were demonstrating self defense. Loved Andy trying to use his neck to break out of a bearhug and then passing out. Ann is just now learning of Andy's capacity for selflessness. She doesn't know he gave Tom $1000 to realize his dream of being part owner of the Snakehole. I don't like Ann sniffing around Andy again. She'd better not ruin this Andy-April thing that has yet to happen. Leslie's Tom impression is spot on. Andy Samberg should replace Paul Schneider next season. The video of Jerry falling in the pond chasing after the burrito really really was great. "He refused to share with a dog!"